There are few better ways to develop a good reputation than working with charities, so why don't more businesses do it? The simple truth is that many don't know how, or are unaware of the full range of options available to them. If you'd like to get your small business involved in working with charities as a means of contributing to the well-being of your local community, it's well worth taking the time to explore the possibilities on offer. Getting involved with charities doesn't need to entail a huge financial commitment but it does involve a personal commitment, so it's important to get it right. When you first take a serious look at getting involved with charities you may well be surprised by just how many are out there. Choosing the right one isn't as simple as it may seem. Whilst there are some big, well known charities which practically everyone is positive about, these organisations have publicity machines which dwarf your own and many already have much bigger corporate sponsors, so there's a danger that your business' contribution won't get noticed by the public. It's often a better strategy to find a local charity, or one with a local connection. That way, local people are more likely to notice what you're doing and to register it as a contribution to the well being of the whole community. When you choose a charity to get involved with, image is important. A charity which focuses on delivering an active service or on raising funds through sports events can make you seem dynamic; one which helps people to express themselves can make you seem creative; and so forth. Try to choose a charity whose image fits in well with the one you're aiming to build for your business. However it's also worth considering personal connections. 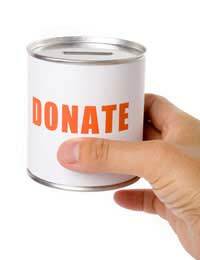 Have you or someone in your family directly benefited from the sort of service a particular charity is offering? Perhaps you have an elderly parent with dementia and would like to support an Alzheimer's research charity. Perhaps you're a first generation immigrant and would like to work with a charity to build bridges between Britain and your homeland, to help people there. As well as providing personal satisfaction and helping you to keep up a long term commitment, a personal connection like this will appeal to your customers. It will help them to see you as a person and to develop the sort of loyalty they might have for a friend. Working with charities in your local community can be about much more than just donating money. Often charities need specific, targeted help to enable them to provide the best possible service to their target group. They can also provide advice about that group which can help to improve the service you offer. For instance, a charity working with elderly people might assist you in making your premises more accessible, and you could assist them by providing a discount, in their name, for customers over sixty five. You could also offer them free or cut-price use of the business services you provide. Perhaps you could provide them with space to hold their events or snacks to eat there; perhaps you could include their leaflets when you distribute advertising around local houses, or provide technical assistance to maintain their equipment. Options like these make it possible to become usefully involved with charities even if you're not making sufficient profits to donate consistently. It should go without saying that working with charities will always make a small business look good. This is one of the easiest forms of cross-promotion to put into effect. Even without major publicity drives, the simple association of your name with that of a charity will help to garner positive attention, and will make customers feel good about you even if they can't remember why. If you own a shop, keeping charities' collection jars by the till will provide a timely reminder of your involvement every time customers are on your premises. It can also help to raise the profile of smaller charities. In a good business-charity relationship, everybody wins. Make sure you choose a charity whose work you feel strongly about so that you can develop a partnership that offers long term rewards.